A legend makes his long time return to a character he created and is essentially the one villain that is tying every single Marvel movie to its ultimate conclusion in Avengers III. That legend is Jim Starlin and the character he created; Thanos. Take a moment to think about how important the creation of this villain truly is. Every Marvel movie is lending viewers more easter eggs to the collection of the Infinity Gems. At the conclusion of the first Avengers movie most fans were left speechless as the big purple guy turned and grinned at us. Some movie goer’s were seeking an explanation as to who that was and what is he so happy about? Fans of the comic book world were more than happy to oblige to deliver the information. We all finally got a peek into what Marvel is planning and where we are headed. All because one creator had a vision of a mad titan in 1973, we get an unprecedented string of movies to the likes that have never been done in Hollywood…..ever. If it wasn’t for Jim Starlin, we would probably be seeing a different opus upon us, but Thanos is the reason in the here and now. 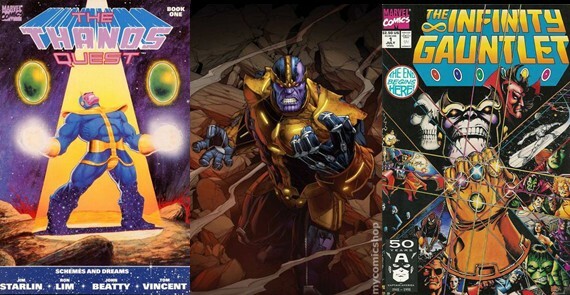 Starlin is the reason and now he is back this week with Thanos Annual (2014) #1. Starlin comes back to his baby. There will be three variants, Dale Keown, Ron Lim, and Jim Starlin. Get the Starlin signed and graded and hold onto it. Along with Jim comes Ron Lim on pencils on Thanos Annual #1. In the solicitation it states that Ron Lim returns with Jim Starlin from Infinity Gauntlet series from 1991. George Perez started on that series as Mr. Lim joined Mr. Perez on issue number 4, then closing out the series with issues 5 and 6 on his own. Ron Lim originally joined Jim Starlin in 1990 (a year earlier) in the two part series Thanos Quest. Here is the deal speculators, buy anything Thanos related from the early 90’s and before. Buy anything Thanos related and try to get professional high grade signature series on them. Hold onto them until images of Thanos starts making its way into every household on the planet in a couple of years. Thanos will be ridiculously popular. Thanos will be the modern day Darth Vader. A villain everyone loves to hate. Buy Thanos. Nuff said. Going on a recommendation from the InvestComics Hot Picks #317, Southern Bastards #1 was a sellout and now the second issue will be arriving this Wednesday on the verge of a sellout sign. The fans over on the IC Poet Society (Facebook Invite Only! Join Us!) are very high on Southern Bastards and are hoping for a possible move on the market with this book. We wait and see…. The InvestComics Hot Picks #312 informed everyone about Sovereign (2014 Image) #1. Now this week Sovereign (2014 Image) #3 is sold out already at the distributor. This might be a sleeper, keep your eyes and wallet ready. A very big deal is afoot in Fantastic Four (2014 5th Series) #5 this coming week. A special double sized issue filled with legendary artist and today’s artist. A nice pick up for the fan that enjoys a collaboration comic. Inhuman (2014 Marvel) #2 will focus on the villain Lash. The cover shows he means some serious business. Giant Size Spider-Man (2014) #1 will be an awesome read, definitely check that out. Doctor Spektor (2014 Dynamite) #1 is showing some nice sales so far. Look for a probable second print coming soon, even though the doctor will be coming with 11 variants. Our friends at SharpComics will have a rare special variant edition of this comic. Check out the details by clicking right HERE. If you’re a Jimmy Palmiotti fan (who isn’t?! ), you may want to buy Futurama Comics (2000 Bongo) #71. He’s a guest writer. Two number one comics are on the brink of sellout status this week, you should keep an eye on these. Dry Spell (2014 Action Lab) #1 and Brass Sun (2014) #1. There are three Image Comics showing signs of brisk sales, but we all know how that can change in a moment’s notice! Trees (2014 Image) #1, Chew Revival (2014 Image) #1, and C.O.W.L. (2014) #1.